We put in a shed behind my raised-bed garden a few years ago and because my garden is my sanctuary, I really didn't want that shed spoiling my view. I wanted to plant something that would not only completely hide the shed, but also something that would help bring loads of bees in to pollinate all of the fruit trees and veggies that I grow back there. I have to tell you, I literally hit pay dirt. I planted one Echium fastuosum, “Star of Madeira”, and it is not only a major bee-magnet, it is absolutely stunning! With hundreds of profuse bluish-purple flowers atop tall spikes that tower above the attractive, variegated foliage, it has become the focal plant in my garden. It is also a favorite for my hummingbirds and butterflies. When I planted it about three years ago from a 2-gallon pot, it was about a foot tall. Now It is now nearly 7 feet tall and about 5 feet across. It would actually be bigger but I continue to prune it so that I have room for the apples and avocados that are planted nearby. There are more than 60 species of Echium, some are native to North America, others are from Europe and the Macaroneisa. Although some are grown as food for humans, butterflies, or moths, most Echium are grown as ornamental plants. 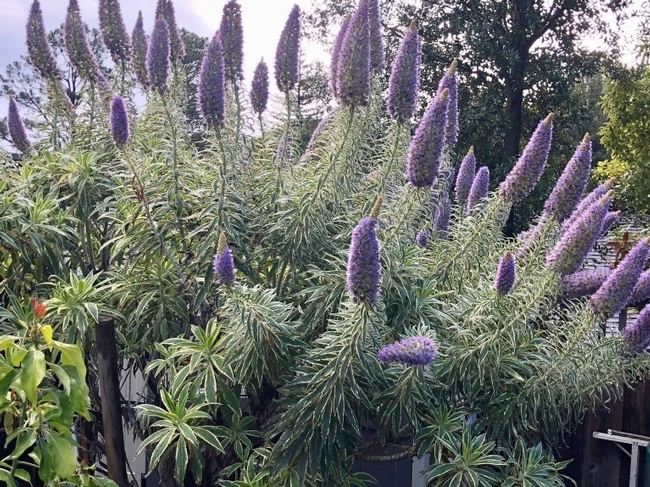 Probably the most common varietal you will find in the Bay Area is Echium candicans, “Pride of Madeira”. Its silvery-green foliage sports masses of very blue/purple blooms from early spring to mid-summer. It can easily grow 8 feet tall by 6 feet wide and is a heavy self-seeder, so you may want to dig up and gift most of those starts. Echium amoenum, “Red Feathers”, is for those of you who want something a little more on the compact side. They grow only about a foot and half tall by about 6-to-8 inches wide. This plant is known to thrive on neglect, is suitable for clay soil and can handle cooler climates. The red feathery blooms attract an array of bees and butterflies. Although it is known to be short-lived, it will reseed itself if you resist deadheading all of the dried blooms. Echium vucanorum, is a truly beautiful, and quite rare, white blooming varietal. It is native to a tiny West African island named Fogo. It will quickly grow to 6 feet high and wide and may do best with some afternoon shade in hotter areas. And for maybe one of the coolest plants you can grow, try Echium wildpretii. It is a biennial from the Canary Islands. In its second year, it will send up tall spikes (up to 7 feet) of gorgeous dark pink/reddish flowers. Let it fully mature so that it can reseed and keep on going … the bees and birds love this one! I believe every garden and every landscape should have at least one bee-friendly Echium. Most need a good bit of room to thrive and grow and at least six hours of sunlight per day. They are very drought-tolerant but do need regular watering for the first couple of years in order to get established. They prefer well-draining soil, but some can tolerate relatively poor conditions. Many Bay Area nurseries carry several options. You can also do a Google-search of Echium to find unique and rare varieties. This may become your new favorite plant. This article first appeared in the April 22, 2018 print issue of the San Jose Mercury News.